For the civil use of this facility and airport information, see Arkansas International Airport. Blytheville Air Force Base was a United States Air Force base from 1942 until it closed in 1992. It was renamed in 1988 to be Eaker Air Force Base. 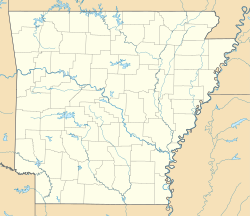 It was located 3 miles (4.8 km) northwest of Blytheville, Arkansas. The facility is now operated as the Arkansas International Airport. It was known as Blytheville Army Airfield during 1942–1948, as Blytheville Air Force Base during 1948–1988, and as Eaker Air Force Base during 1988–1992. The Blytheville Air Force Base Strategic Air Command (SAC) Alert and Weapons Storage Areas Historic District was listed on the National Register of Historic Places in 2018. It is a 247 acres (100 ha) historic district which included 23 contributing buildings, 33 contributing structures, two contributing sites, and a contributing object, as well as two non-contributing buildings. ^ "Eaker Air Force Base". ^ a b "National Register of Historic Places: Weekly list". National Park Service. January 26, 2018. ^ Edward Salo; Edward Harthorn; Zach Mitchell; Frank Walker; Travis Raterman (September 11, 2017). "National Register of Historic Places Registration: Blytheville Air Force Base Strategic Air Command (SAC) Alert and Weapons Storage Areas Historic District" (PDF). National Park Service. Retrieved February 19, 2018. With maps and 23 photos. Wikimedia Commons has media related to Blytheville Army Airfield. Wikimedia Commons has media related to Eaker Air Force Base. This article about a property in Arkansas on the National Register of Historic Places is a stub. You can help Wikipedia by expanding it. This page was last edited on 4 April 2019, at 08:57 (UTC).